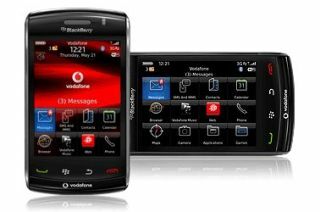 RIM and Vodafone have announced the new BlackBerry Storm 2, with the CEO labelling it 'a biggie'. The new phone will be available from 26 October, and will come on a two year, £35 per month deal as we exclusively told you earlier this week. As we reported, the phone has a 3.2MP camera, 2GB of on-board storage and an improved SurePress screen, the 'clickable' option used on the original storm. It also has Wi-Fi capabilities on top of the 3.5G connection, as well as a sleeker chassis and integrated physical front keys. There's also a 3.25-inch HVGA touchscreen, as well as full integration with Windows Media Player and iTunes thanks to BlackBerry Media Sync. However, Vodafone confirmed to TechRadar it will only be first to market with the Storm 2, not on an exclusive deal like before, which we assume is because the network recently announced it will also be stocking the iPhone from next year. It's likely the Storm 2 will remain with Vodafone possibly until Christmas, when the likes of Orange and maybe O2 will also pick it up, although this is unconfirmed. Vodafone and RIM were heavily involved in the joint development of the first Storm phone, but now it seems RIM is looking to extend the reach of the device further to improve its chances of success. If you're interested in picking one up, head on over to the Vodafone pre-order page now.